Giving a shoutout to Gucci Mane’s favorite number. 1017 vs The World 🌍🤘🏾🔥®. Earlier tonight, Lil Uzi Vert went to Twitter and Instagram to announce the name of his forthcoming mixtape, "1017 vs. The World." While the title mimics his "Lil Uzi vs. 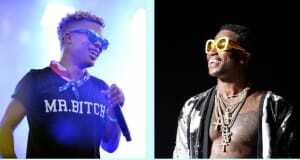 The World" tape that he released earlier this year, Lil Uzi's use of the number 1017 hints that Gucci Mane or his label will be involved with the project in some way. If you're not familiar, 1017 corresponds to Gucci Mane's 1017 Brick Squad label and has important significance because it was Gucci's grandfather's house number. The "Lemonade" rapper was also tagged in Uzi's picture on Twitter. The FADER has reached out to representatives for Lil Uzi Vert and Gucci Mane for comment. Last month, Gucci Mane sat down for a Hot 97 interview with Funkmaster Flex, stating that he supports the new generation of rappers. After Funk asks Gucci which rappers he wants to collaborate with next, Gucci cited Lil Uzi as one of the "young people" he would love to work with. Hopefully, the two both have something in store for their fans. While Lil Uzi Vert hasn't confirmed a release date for his project, he assures us that it's "coming soon." Revisit Lil Uzi Vert's GEN F profile from The FADER.